This year, the festive season is infused with the spirit of generosity, curiosity and creativity that has defined the House of Martell since it was founded in 1715. An exclusive limited edition, the result of a collaboration with the French artist Mathilde de l’Ecotais, invites cognac lovers to discover or rediscover three House classics in contemporary ways – both visually and through new taste experiences. Martell Cordon Bleu, Martell Blue Swift and Martell VS Single Distillery are revealed in a singular light by Mathilde de l’Ecotais, a contemporary artist and photographer whose creative encounter with the House of Martell began around shared values: a profound attachment to nature and the terroir, and the use of traditional know-how to craft something bold and modern. For Mathilde, the fusion of tradition and modernity is focused on the cyanotype technique. Invented in the 19th century, this elaborate photographic printing process utilizes a cyan solution, which is applied to paper with a brush, in order to create images that are revealed through exposure to sunlight. The images are characterized by their colour – an intense blue, which the artist uses to celebrate the signature blue of Martell. This exceptional encounter between art and cognac finds expression in a limited edition which highlights the special character of three emblematic Martell products. For the House icon Martell Cordon Bleu, renowned as a rich expression of the rare Borderies terroir, Mathilde overlaid an image of grapes and vine leaves with sweeping circular brush strokes to evoke the famously round, generous flavours of this legendary cognac. For Martell Blue Swift, a VSOP finished in Kentucky bourbon casks in homage to the House’s historic ties with the United States, the artist chose to magnify the Martell swift emblem on a background of vanilla, suggesting the distinctive smooth, sweet notes imparted by the barrels. For Martell VS Single Distillery, Martell’s unique expertise – the double distillation of exclusively clear wines – is represented with a pattern of bubbles and dynamic strokes, capturing the energy of the distillation process. These striking images set the tone for Martell’s festive collection, which – in addition to exceptional gift ideas – offers the prospect of memorable moments to share throughout the Holiday season and the New Year. The Martell Cordon Bleu bottle, transformed by sumptuous tones of gold and blue, is presented on a pedestal within a luxurious case, emphasizing its iconic status. Martell Blue Swift is packaged in a gift box with an engraved metal julep cup, while Martell VS Single Distillery is accompanied by two engraved glasses. To bring cognac lovers together around a shared taste experience that epitomizes the art of generosity, the House of Martell gifting collection also offers suggestions for creative serving rituals: mixing Martell Cordon Bleu with sparkling mineral water to make a refreshing Halo, revisiting a traditional Mint Julep with Martell Blue Swift, and bringing an unsuspected twist to a classic Sidecar cocktail with Martell VS Single Distillery. What more delicious way to combine tradition and modernity? Alongside the gifting collection, the House of Martell presents a state-of-the-art digital experience featuring the House icon Martell Cordon Bleu. Cognac lovers are invited to create their own personal décor around the bottle, and then to transform their artwork into an electronic gift card to share with friends and family. 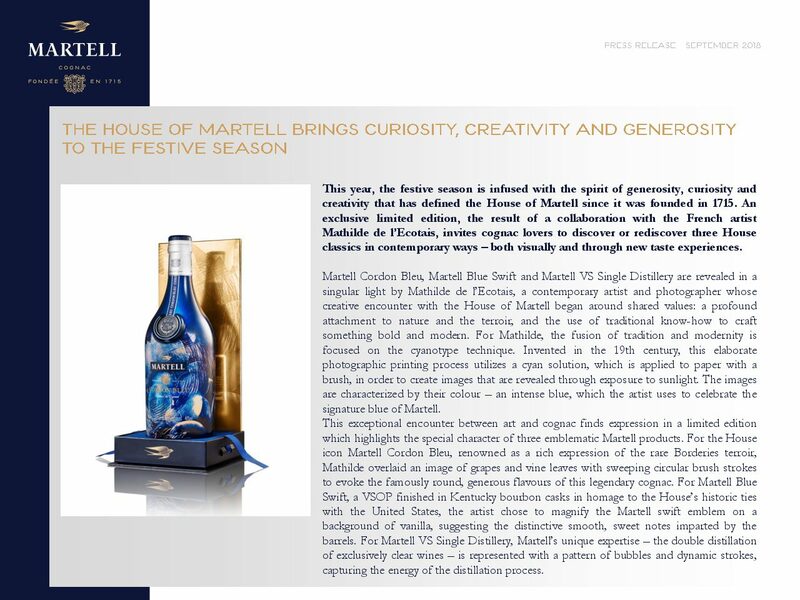 The experience is available in 3D, using a VR headset and a “paintbrush”, in selected airports, and in 2D via touchscreens in domestic markets, as well as via a mobile app, which is accessed by flashing the QR code on the Martell Cordon Bleu festive limited edition. The digital experience will be available worldwide between November 2018 and February 2019.